A few years after my first experience with dark energy, I had another, more concrete encounter. I was actually awake this time and standing outside of my partner’s closed garage door. It was nighttime and the florescent lights inside the garage were on, as I could see through decorative windows on the garage. I was staring sort of blankly through the garage window when I saw it: A solid black figure, balloon or head shaped, that rose up to the window and then quickly down, almost as if to peek-a-boo at me. I don’t think I’ve ever felt my heart beat as fast as it did then, as this was a completely unknown darkness I had just witnessed, even more mysterious to me than the first dark mist I’d seen at my Grandma’s. What was so strange about it was how black it was, darker than black. I have never seen something so dark, so tangible, yet so inexplicable. There was no one else in the garage at the time, I found out as I questioned my boyfriend. Either way I didn’t really need that confirmation since I knew what I saw, and it wasn’t human. 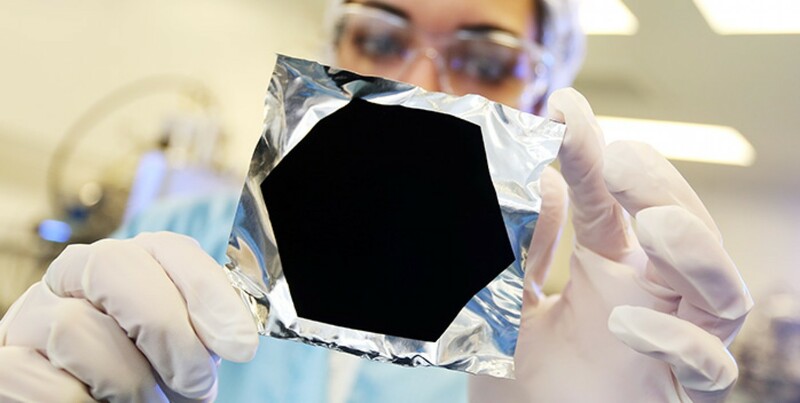 Recently scientists have created a material so dark that the human eye can’t comprehend what it’s seeing, as it’s the closest thing ever created to resemble a black hole. Apparently it absorbs only 0.035 percent of visual light, leaving no shapes or contours to be seen. 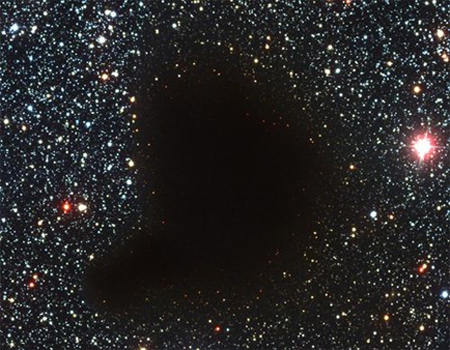 Called Vantablack, it was developed to be used in space as a material that adjusts cameras to take photos of ancient celestial objects of the universe…not sure what those are, but perhaps old stars or universes? The reason I brought Vantablack up is because it reminds me so much of that darkness I saw in the garage that night; so abysmal, so dark. The only difference is scientists created Vantablack, and not the strange dark shape I saw in the garage. So did I see a black hole? Did I see a tear in the fabric of our universe’s dimensions? I’m not quite willing to call it evil, because aside from the shock of witnessing something so unknown and dark, I wasn’t as instinctually terrified as when I had seen the dark mist at Grandma’s. Numerous origin stories from people around the world deal with the cosmos, and the Indigenous people in my hometown, my ancestors, can be counted among them. In the beginning there was kíwvish ‘atáxvish, which literally translates to “empty, unpopulated”. Kíwvish ‘atáxvish is actually a living being, as real as a person or animal. Simultaneously, it’s the only being populating the area while also being the area itself. So what is nothing, emptiness? It’s a subjective concept really, but it’s hard to describe what ‘empty’ exactly is. The way I imagine it in this creation story, ‘empty’ is a space void, kíwvish ‘atáxvish. 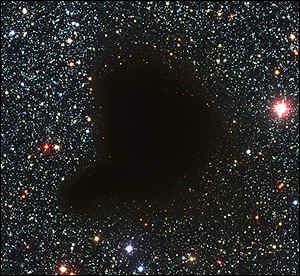 Voids in space are what astronomers depict as a blank space with little to no galaxies. It is the pitch black we see in between matter in space. In an origin story, it would make sense if this is what was present at the beginning of time, before anything else was created yet; A darkness, vast and empty, waiting to be filled with something, in this case the components of life. Philosopher Eugene Thacker states that in most cultures darkness holds negative connotations, stating examples of the “moral or theological connotation of good vs. evil, light vs. dark forces”, as well as the “Copernican shift from out of the Dark Ages into an entire epoch of mature Enlightenment”. To be honest, he’s onto something with that; In all my contemplations about what this dark cloud at my Grandma’s could have been, I was always more inclined to go with some negative energy that rendered me literally speechless. If anything, the Catholic/Westernized culture I was raised in reinforced my belief that the darkness I saw was evil. This Catholic idea of the dark being inherently negative is in contrast to my Indigenous ancestor’s more neutral idea of the dark. While Western Catholicism’s idea is that the dark is disingenuously bad, my Indigenous California ancestors view this darkness as a possibility for creation, an empty canvas if you will. Today I am more inclined to feel this way about the darkness I encountered in the garage. The darkness I saw at my Grandma’s, however, still conjures feelings of fear. Is it the demonic entity Catholic schools taught me to fear? Who knows, but I think that regardless of religion, there are good and evil spirits existing among us, who care not of our religious affiliations (or lack of)… but that’s another story. Lately philosophy through negation has helped me to interpret these dark energies I’ve experienced in ways I never thought possible. Through negation, philosophers have tried to understand the divine by describing how it is not rather than how it is. For instance a 16th century monk, John of the Cross, focused on the divine “in terms of darkness and negation, resulting in a mystical unknowing of the divine in its inaccessibility,”. Surely this might explain the darknesses I’ve encountered; I didn’t summon them, they appeared to me, on their own nonsensical terms. And unknown forces that come to you randomly are by default inaccessible (For how would I be able to access something I don’t know?) And thus my inability to explain these dark energies I encountered is what makes them so divine, transcending any physical manifestation we humans have known or studied. As philosopher Eugene Thacker puts it, all paths via negation “lead to darkness, an absolute limit to the human capacity to know itself and the world, a limit [Georges] Bataille nicely encapsulates in the phrase “the excess of darkness”. Because I know so little about the reality of what I experienced, I am in awe of it. Does this mean that the divine’s existence is so beyond my comprehension that I will never understand it? It’s like I speak with my tongue and the divine speaks with its toes, or with a completely different language, or not at all…No wonder I can’t understand what it’s trying to say. Ironically, saying I’m in the dark in trying to understand this divinity is at least admitting that it exists. If you’re not sure of anything on earth, and you’re anything like me, you will try to find the answer to mysterious experiences through any means possible, whether it be philosophy, science, or religion. And if you’re anything like me and inclined to see all sides of almost any theory, then it can be hard to find concrete answers. As it stands I’m still on my quest for the absolute truth, and so far the quest itself has been most rewarding; I see the validity in almost all my means of investigation, and the mystery has allowed me to delve into fascinating topics I would never normally think about. I don’t think humans should always have the divine knowledge of the cosmos and dimensions that we think we should; Some things aren’t meant to be understood, because we might spoil them with our lust for power and our innate ignorance. If we had knowledge of certain things, we might tip the scale of nature even more unfavorably than we already have. Maybe humans are supposed to be in a constant wonder for an insatiable truth, because this quest has arguably been one of my most human experiences yet…Because the thrill of simply not knowing, of searching for the truth, is ironically keeping me in the dark yet simultaneously enlightened. Eugene Thacker, Starry Speculative Corpse (United Kingdom: Zero Books, 2015),17. Thacker, Starry Speculative Corpse, 33.